The increasingly popular, and profitable, Hulu recently released a desktop application bringing their streaming video out of the web browser. Currently in beta, Hulu Desktop is available for download on PC and Mac. The application is configured to receive commands from Windows Media Center and Apple remote controls, which helps Hulu bring their content to the living room television. Windows remotes can be purchased at most electronic retailers. Hulu Desktop alleges to carry the same content the browser version does, but the company is ambiguous over if that is the case now or if it will stay that way in the future. You can login to your existing Hulu queue however. I installed the Mac version on my Macbook, but I can’t get any content to appear in the application. It is in beta so I’m not expecting it to necessarily work smoothly, but for me it’s not working at all. I also installed the Windows version on a desktop computer. I got the message “We’re sorry, but Hulu Desktop cannot connect to the Internet.” So that’s two times the fail. I’ll continue working with this new application and let you know how it works. Hulu must have been working on their servers this morning. I have successfully connected with Hulu Desktop on both Mac and PC and the interface is very slick, quick, and easy to navigate. I navigated through popular TV shows with ease, and the video played very quickly. It appears like Hulu is checking your internet connection and providing the best video quality available. Good job! 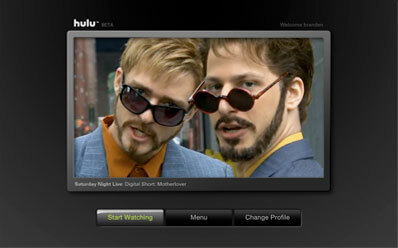 I’ve been waiting for an option from Hulu to always play the high quality video, but this makes it even easier.